Bring water to a boil in a very large, deep heavy pot. Place the beets in the hot water and boil until a fork can be easily inserted into the center. Remove the cooked beets from the water to cool. Peel and remove both ends. Slice into very thick slices. Place the lettuce on a platter for a base for the remaining ingredients. Spread a layer of the thickly cut beets on top of lettuce. 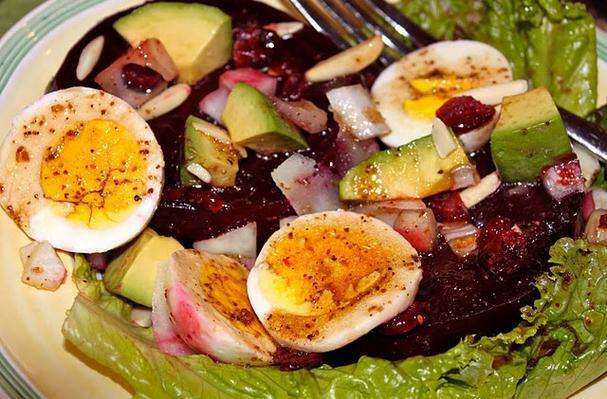 Place the chopped avocados, onions, sliced eggs, dried cranberries, slivered almonds and slivers of Manchego cheese. Drizzle the vinaigrette over the salad. Salt and pepper to desired preference. Super good and healthy veggie salad, so colorful and delicious with red beets, avocados, eggs, almonds, dried cranberries, and manchego cheese!